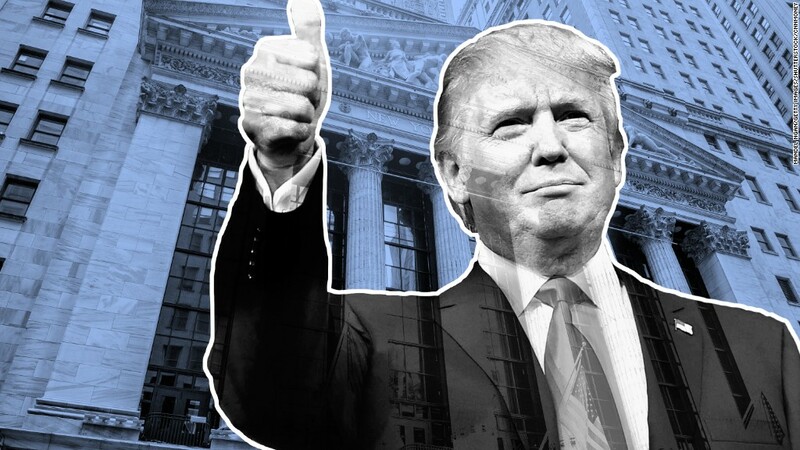 President Trump unleashed tweets over the weekend slamming the "fake news" media for once again ignoring terrific economic news. Among other good economic and markets news, Trump said the "drilling & energy sector" is "way up" since the election. But if Trump's Oval Office desk isn't covered with articles detailing a boom in drilling and energy stocks, it's because there isn't one. These stocks have done terribly since the election. The S&P 500's energy sector is down more than 4%, even as the Dow has soared since November 8. 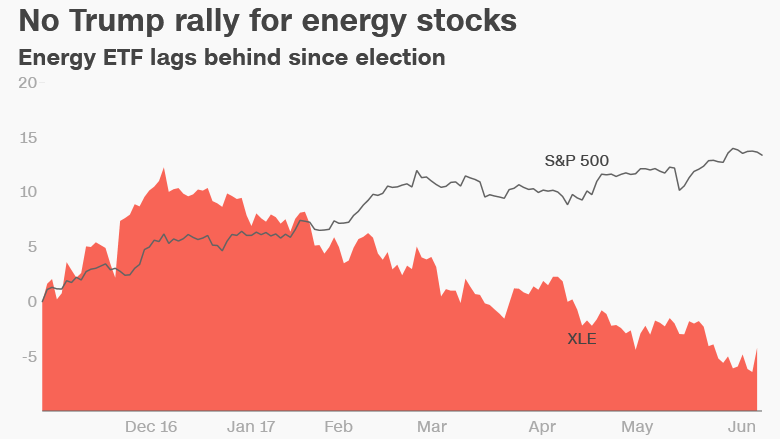 Energy is actually the only sector among 11 in the S&P 500 to lose ground since Trump's win. ExxonMobil (XOM), one of the most popular energy stocks, is the worst-performing Dow stock after the election. Perhaps Trump meant just drilling stocks? Well, the oil & gas drilling subsector has performed even worse, plunging 12% since the election. "It's been woeful. Energy is trailing the pack," said Stewart Glickman, energy equity analyst at CFRA Research. Digging into the S&P 500, some of the index's biggest post-election losers are in the energy world. Anadarko Petroleum (APC), Noble Energy (NBL) and Range Resources (RRC) have all tumbled at least 18% apiece. Many assumed energy stocks would take off in the Trump era. After all, the president has made unleashing the American energy industry a top priority and he recently ditched the Paris climate accord. Trump even named former Exxon boss Rex Tillerson his secretary of state and tapped ex-Texas governor Rick Perry to be energy secretary. As Trump mentioned on Twitter, he's also moved to rip up regulations that some say have burdened the energy business. His proposed budget calls for drilling in Alaska's fragile wildlife refuge. But does the oil and gas industry really need to be unleashed? Prices for both oil and gas have crashed in recent years due to massive supply gluts caused by the American shale revolution. Pumping even more risks making those gluts larger, at least in the short-term. "If an individual company is able to maximize production, that's great -- unless everybody's doing it. That's not so great," said Glickman. These oversupply concerns have kept a lid on oil prices. Even though OPEC and Russia reached a deal in November to curb production, oil prices are basically back to where they were before the election. Oil investors remain nervous about resurgent U.S. oil production, especially from shale producers in the Permian Basin of West Texas. Drilling activity has accelerated since Trump's victory. The number of U.S. oil rigs has soared 65% since the election, including each of the past 21 weeks, according to Baker Hughes. But that hasn't helped oil prices, or energy stocks. "It's ironic. Every step you take to maximize production is weighing on price because demand isn't absorbing all of the glut," Glickman said. To be fair, Trump's tweet accurately reported other positive economic trends. For instance, he correctly noted that unemployment has tumbled to 4.3%, which CNNMoney previously reported is the lowest level since May 2001. Trump also noted that the Nasdaq is up more than 19% since the election. However, that could change if the recent plunge in popular tech stocks Facebook (FB), Apple (AAPL), Netflix (NFLX) and Google owner Alphabet (GOOGL) continues.